Evergreen College group focuses on diploma and certification programs that are designed to fill real needs in today’s job market. The college is committed to the success of students and graduates, and has tailored the services to ensure that Evergreen stand by you every step of the way to get you the career and the future you’ve always wanted. The Evergreen Colleges are located in eight conveniently based campuses all over Canada that offer a variety of unique diplomas and certification programs. All programs at the campuses are designed to fast track candidates into a new career, with co-op and field placements to give a real world experience. Giving students a comprehensive education and getting them job-ready is always the priority. All classes are taught by experienced, caring instructors who are specialists in their field and are committed to teaching students the skills that are in demand in today’s job market. 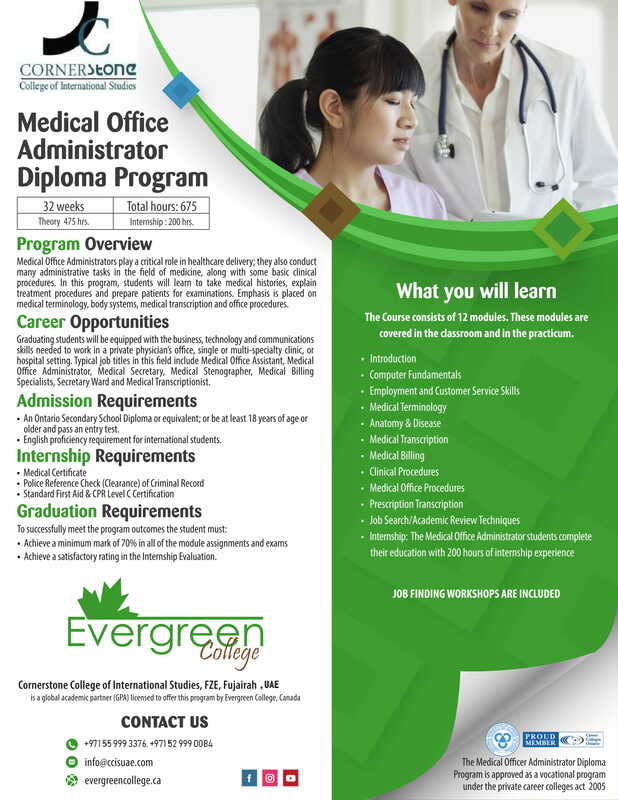 The Medical Office Administrator Diploma Program is designed to provide students with the business, technology and communications skills needed to work in a private physician’s office, single or multi-specialty clinic, or hospital setting. Emphasis is placed on medical terminology, body systems, medical transcription and medical office procedures. Upon completion of the program, students will be able to conduct medical histories, explain treatments procedures, and prepare clients for examinations. Our Medical Office Assistant Program also fosters the development of interpersonal skills, organizational effectiveness, and communication skills necessary to function. The Medical Office Administrator students complete their education with 200 hours of internship experience.